It’s no surprise that the 2017 San Diego Padres are more than 10 games under .500 a little over one-third through the season. There has been some pleasant surprises so far, but also some disappointing performances. There has been some solid baseball played, but also some pitifully poor performances, lacking hustle and basic fundamentals. Some games have been hard to watch this year, but fortunately the Padres have found themselves in some competitive games as well. First off, the Padres opened the season with four catchers, Jhoulys Chacin starting opening day, three Rule 5 Draft players, a catcher attempting to pitch out of the bullpen, and seven rookies on the 25-man roster. Only six had rookie status entering the 2017 season, but Austin Hedges can essentially be considered a rookie as well. 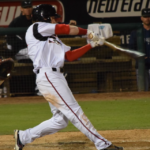 The others include Manuel Margot, Hunter Renfroe, Luis Torrens, Allen Cordoba, Jose Torres, and Miguel Diaz. The facts above basically diminish any expectations of a winning baseball team in 2017. Since then, there have been two other rookies that made their debuts; Franchy Cordero and Dinelson Lamet. Impressive debuts at that. The current goal of the 2017 season is to further develop the young core of players on their roster and in their farm system, while raising trade value of players who had a down performances last year. They also wish to benefit from a poor record with a high draft pick in 2018. That being said, fans still want to see competitive baseball being played. 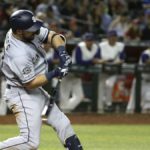 It has been understood from the start of the season that the Padres were NOT going to be good in 2017, and likely would finish in last place in the N.L. West. It does get frustrating watching the team give leads away, and the game concluding with opponent’s high-fives on the infield. 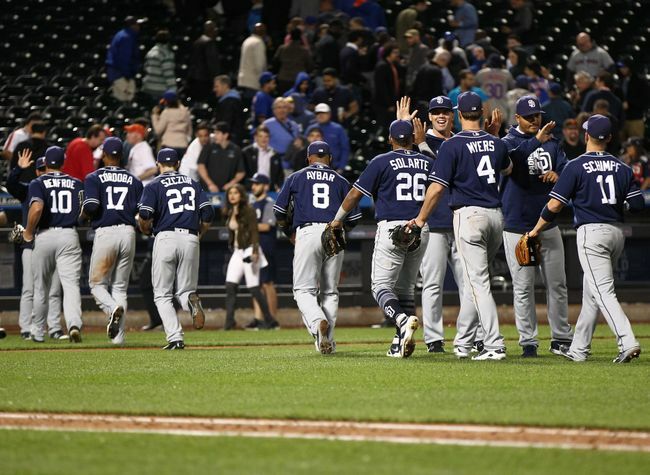 There have been a few games this year that the Padres absolutely should have won. The most recent being against the White Sox, when the Padres took a 3-1 lead into the 8th inning, only to surrender eight runs as a result of walking batters, poor defensive decisions, and lack of hustle. 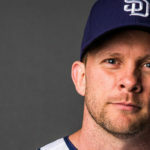 During the post game press conference, Andy Green referred to that 8th inning as “the worst inning of professional baseball I have ever seen.” Green can only keep his optimism and silver lining mentality during post game presses for so long. 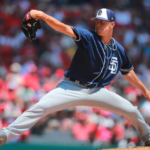 Another recent tough performance to watch was San Diego State alumni and current Nationals’ pitcher, Stephen Strasburg, striking out 15 Padres. To say the least, the first third of the 2017 Padres season has been a rough one, as expected. It hasn’t been all bad though. Here are my grades for the individual players as well as the group in total. The 21-year-old has been the most pleasant surprise for the Padres in 2017. Cordoba is listed as a shortstop, but has seen everyday playing time in left field recently while also batting leadoff. Cordoba’s success is truly remarkable considering this season is his first playing above rookie ball. His success in the low levels of the minor leagues has transitioned into the big leagues well. He was the MVP of the GCL league in the Cardinals’ system and an all-star last season in the Appalachian League. 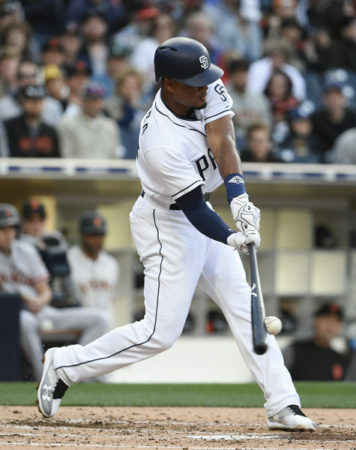 Cordoba has been hitting leadoff for the Padres recently, and has compiled a .292 average and three home runs in 96 at-bats this season. It will be exciting to see Cordoba continue to develop throughout the 2017 season. Hand has been remarkable this season in high-leverage situations. 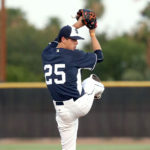 He has found success in every situation he has been asked to pitch in, including coming in with inherited runners on base, closing out ball games, and pitching multiple high-leverage innings. Hand has put together career bests in ERA (1.76), and K/9 (11.53) over 30 2/3 innings this year. The lefty has emerged as a potential trade candidate recently, with possible suitors being contenders looking to bolster their bullpens. Hand has solid trade value and could bring an excellent package of prospects in return. Before landing on the disabled list, Cahill has been one of the best surprises in the rotation this season. He posted a 3.27 ERA with 51 strikeouts over 41 innings. Cahill has been on the disabled list since May 14 with shoulder inflammation. On the bright side, an MRI revealed no structural damage and Cahill was shut down 10-14 days from baseball activities. Trevor Cahill was arguably the best starting pitcher for the Padres prior to his injury, and hopefully he can return soon to pick up where he left off. 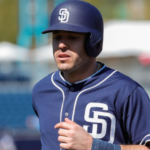 The Padres signed Cahill to a one-year contract in the off-season. The face of the Padres signed the largest contract during the off-season, and is living up to it for the most part. Myers is falling short of his 40-40 goal so far. He has hit 11 home runs and stolen six bases through the first two months of the season. The 2017 season is 1/3 of the way through, and Myers is on pace for approximately 33 home runs and 18 stolen bases. A 30-30 season was certainly in reach last year when Myers had 28-28. He could potentially still reach 30-30 in both categories this year, which would be very impressive, but he needs to start running more often. Wil Myers falls short of the “A” grade because of his frequent strikeouts, shaky defense, and poor decisions on the basepaths. Myers leads the team with 65 strikeouts. Wil Myers also had a poor month of May, hitting .214 for the month compared to his .310 average in April. 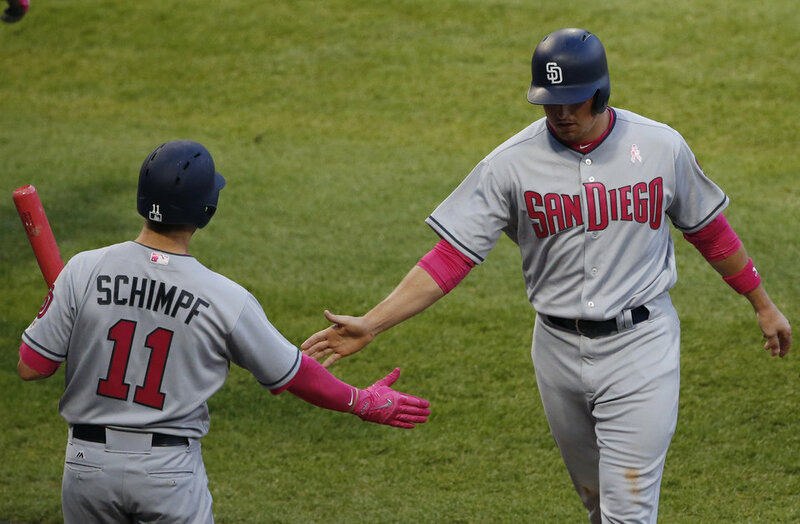 Regardless of his recent struggles, Wil Myers has put together the best statistics offensively for the Padres this year, and will likely be the Padres’ lone MLB All-Star Game representative. Richard has been arguably the Padres most reliable starting pitcher in 2017. He also has pitched the only complete game for the Friars in 2017, with his one-run complete game gem. He also threw eight shutout innings in the second game of the season at Dodger Stadium. Richard has a 3-6 record with a 4.33 ERA in 2017. Another notable statistic about Richard is that he has more pickoffs (four), than stolen bases allowed (three), while he has been on the mound. This is because the lefty’s marvelous pickoff move. The right-handed reliever was claimed off of waivers by the Padres from the Angels. Since joining the Friars, Yates has pitched well. He has a 1.93 ERA over 13 appearances. He has been a reliable option for Andy Green coming out of the bullpen. He could also be a trade chip if he continues to pitch well. Reliever Jose Torres is in his first major league season with the Padres. The rookie has a 3.71 ERA with three wins and a save over 27 innings pitched this year. Torres, who figures to be a starting pitcher in the long run, has looked dominant at times in 2017. The Rule 5 pick from a year ago has continued his success from the second half of last year, into the 2017 season. Despite a 5.01 ERA, Perdomo has a six quality starts out of the nine games he has started. Perdomo developed a sinker in the second half of last season, and has been a solid starter since the pitch came into his selection. Perdomo has found success keeping his pitches low in the zone, creating a high ground ball rate and soft contact. Luis Perdomo has yet to record a victory in 2017, but has pitched well enough to do so, and he has even swung the bat well this year. The rookie has impressed in the everyday leadoff spot for the Friars in 2017. He started his Petco Park career off with home runs in his first two at-bats. He has hit .259 with four home runs and five stolen bases in 2017. Margot has also played stellar defense in center field, making some serious web-gems. Most importantly, the 22-year-old is proving that he can handle everyday major league pitching, and that the Padres aren’t rushing him. Margot is currently on the DL with a sprained right calf, but should return very soon. Renfroe has showcased the power he is capable of in 2017. The rookie raised red flags early in the season, walking only twice in the month of April, while striking out 28 times. In May, Renfroe has shown more patience and drew a walk 15 times in the month. He got on base at a .231 clip in April, compared to a .358 OBP in May. The rookie has hit .235 with 10 home runs so far total. His average should continue to climb with his improved approach at the plate. 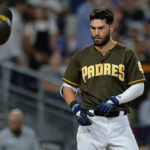 The rookie leads the team in errors with seven, but Renfroe has also shown off his cannon arm in right field this season. MLB Statcast recorded a throw to home from Renfroe against the Cubs as the fastest in the majors this year at 101.6 mph. The starting catcher has hit .209 with nine home runs in 2017. The young backstop has shown his power potential early on, and his low average isn’t so bad, considering he started the season 0-25. Hedges has been dominant defensively, throwing out 29 percent of base runners attempting to steal, recording a .990 fielding percentage, and has allowed just two passed balls over 368 innings behind the plate. The Padres’ pitching staff raves about Austin’s abilities behind the plate. The right-handed pitcher was taken by the Twins number one overall in the ’17 Rule 5 Draft, and was dealt to the Padres. Diaz is only 22 years old. He has surpassed expectations in 2017 despite two rough outings against the Dodgers, where he surrendered nine earned runs over two innings. Diaz is 1-1 with a 7.15 ERA. Take away those two outings against the Dodgers and Diaz would have about a 3.90 ERA. Considering he is a rookie, and is in his first season above Low-A baseball, Diaz has been a tremendous success. The youngster can be filthy hitting against, featuring a high 90s with movement as you can see below.